I believe that language is material for design. Language influences how people use and think about a product. The words you use can create either friction in the user journey or delight, shaping behavior across the entire system. How you talk to users matter because it makes them care (or not). Does your product feel warm, or is it uninviting? Do certain words help or alienate people? Getting people to care starts with addressing their needs in a way that makes them feel understood. That’s why voice and tone is a design decision, just like navigation or layout. Perhaps your company is still a startup. That’s no reason to save voice and tone work until later. Part of what made Slack different from launch is its distinctive copywriting. Because language affects every part of the user experience, it’s best to think about this early. By planning for how you communicate within the product, you’ll make it feel well-built – and even lovable. Let’s begin by considering the role of voice and tone in shaping a brand. Great brands are felt, distinct, and believable. It is the sum total of a person’s perceptions about your company and its products. Therefore, brand is created in the mind. Any interactions with the company influences perceptions whether they are beneficial or not. Most importantly, a brand is a promise to your users that are differentiated from competition. It can be both functional and emotional, but it has to be differentiated to be compelling. Returning to Slack, the company promises a different experience compared to other apps like Hipchat or Campfire. And that differentiated promise contributes to its rapid adoption rate. To be effective, a brand needs to narrow its focus. Although we will only cover voice and tone, all the elements work together to sharpen a brand. The job of brand voice is to convey preferred qualities through language. It reflects the company’s culture. It is lively, human, and appropriate. It doesn’t sacrifice clarity for personality. Voice and tone aren’t the exact words you use in your interface copy; they inform the copy you write. Voice is your company’s public personality; it doesn’t change much from day to day. Your tone, however, adjusts your voice to fit different situations. Usually you have one voice but many tones. A great brand voice is distinct, recognizable, and unique. It also needs to support your customers as well as reflect your business’s purpose, vision, and core values. We will work on these foundational elements first, and then circle back to your tone. While companies may give an eye roll to the word, “authenticity,” true voice is grounded in your values, supports your vision, and embody your purpose. A great voice captures why a business exists and what it wants to change in the world. You can actually feel the power of words when someone speaks with purpose and intention. It just feels different. Let’s take a look at each part. Jot down ideas for each one as you read it. Purpose: What is your company’s most fundamental reason for being – its raison d’être? Why do you do what you do, and why is that important? Start from what your company does and then ask “why” in succession to peel back the layers of motivation behind your work. Vision: BHAG stands for Big Hairy Audacious Goal. It frames your vision and provides a self-evident, gut-grabbing, and highly-energizing goal that unifies team effort. It fuels the spirit behind what your company does. How should the world look like when you’ve reached your goal? What will change once you’ve succeeded? Describe where you want to take people. Make a customer’s day, everyday. Brand values are the shared value of people. Values are uncovered, not created. Similar in philosophy, voice is discovered, not created. As Kate Kiefer Lee and Nicole Fenton mentioned, voice should reflect the company culture and put customers first. To do that, we need to get to know the company and its customers. It’s hard to craft an authentic voice without bringing other people into the process. Your brand voice should reflect the people behind the company as well as how customers feel about your brand. Start by reaching out to people who are enthusiastic about voice and tone work. Don’t forget to include stakeholders who you need buy-in from. Sit down with your teammates, colleagues, and founders/execs, and interview them. Listen to stories and themes that emerge. Why did you start this company? What led you to the idea? How did we get to where we are? What was driving the force behind it? If your brand was a person, how would you describe them? List as many characteristics as you can think of. Why do you like working here? What makes this place feel special? Who do you see as our competition? How are we different? Who inspires you online or elsewhere? Who do you want to emulate? Are there any associations that we want to avoid? What would alarm or deter our users? What do you know about our users? What do they care about? What does success mean for us? Where do you want to take our users? How do you want people to feel when they visit your website or use our products? What are people’s gut reactions? Which questions make their eyes light up, and what stories make them smile or laugh? Look for people’s true personality and company culture. Then pick out parts that feel compelling and consistent, and boil them down to a few themes. Look for reasons behind what’s important about them and what people are trying to accomplish. What are some qualities or phrases that people repeat? Let people know where you are in the process and keep them in the loop. You might follow up with a few of them if they said something particularly interesting. A great voice captures why a business exists and what it wants to change in the world. Hopefully you got a better sense of your company’s purpose, vision, and core values through your interviews. Next, we’ll distill what you’ve found into a mission statement that you can use to orient your product communication. It will help your writers craft copy with purpose. Your mission defines your purpose – the reason behind your work. A meaningful mission statement helps you share your values with other people. When your team lacks shared vocabulary, you risk contradicting one another. A clear mission orient teams toward clear goals and priorities, and your communication will reflect that clarity. What do we do, and why does it matter? If we are successful, what will be different in 5-10 years? Take some of the phrases you’ve written down during your interviews and tease out some key words. Combine them into coherent sentences. Experiment with different words and sentence structures until you feel like it’s something your teammates would say. Once it feels complete, see if you could remove any words and statements that aren’t exactly true. Each word has to pull its own weight so make sure you (and your company) can stand behind every one. We make (plural noun) for (audience noun). We help (audience noun) (verb) (adverb). We want to (verb) (noun) to (verb) so they can (verb) (adverb). Like a Russian doll, your mission should encase the values that drive the company while orienting teams toward the future you want to create. Think of your mission statement as an internal tool rather than a marketing message. Make sure your team agrees on what it means since it’ll act as a compass. Once you gained clarity around your mission, your company needs a way to manifest its core values and vision. A message architecture helps you define the qualities you want to convey to activate your mission. These qualities act as a filter for your voice. Simply, message architecture is a hierarchy of communication goals. It captures the attributes that appear in order of priority, typically in an outline. It also prescribes a concrete and shared terminology to evokes that mission. This could be MOO’s message architecture based on how it communicates. 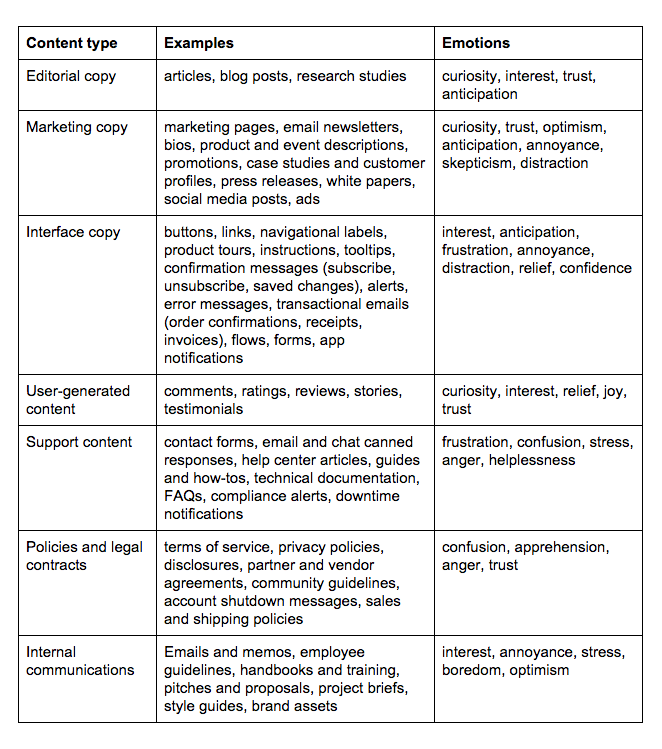 Example from Margot Bloomstein’s book, Content Strategy at Work. In her book, Content Strategy at Work, Margot Bloomstein uses card sorting to help companies figure out these attributes. Here are the steps you can take to uncover how your co-workers describe the company. At the end of this exercise, you want to establish 3-5 main communication goals. 1. Choose the right mix of people to include in the exercise. You might include decision makers, marketing copywriters, designers, creative directors. Limit to 6 people. An attribute can express both values and vision. For example, take down-to-earth. A “down-to-earth” company might prioritize staying close to its customers. It might also focus on the fundamentals and even seem matter-of-fact. It’s crystal clear on what’s most important to the organization. For its vision, it might choose to do the simple things right instead of chasing the latest trends. Its focus might be on the craft and details rather than on beating the #1 competitor. 3. Sort the cards into 3 categories: who we are, who we’d like to be, and who we’re not. 4. Remove attributes that are least relevant and refine the list. Then discard the “who we are not” pile. Narrow down to a few key words you’d want to hold on to, and decide whether they belong in the “who we are” or “who we’d like to be” pile. 5. Rank the remaining attributes in the “who we’d like to be” pile. Some natural groups might form. Prioritize what quality needs to be communicated first and how it connects to the next group. 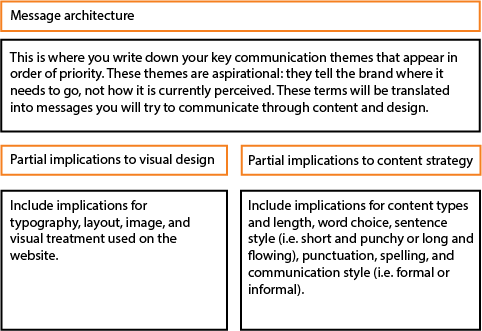 From here, you can synthesize and translate the resulting message architecture into implications for visual design and content. From Margot Bloomstein’s book, Content Strategy at Work. Not only does the message architecture inform voice and tone, but it can also inform the look and feel of the user experience. By achieving consensus around communication goals, and translating them into tactical decisions, a message architecture makes your product feel more cohesive. An alternative way comes from Mike Atherton where you pick two attributes that describe your company and one that is the opposite, using Jennifer Aaker’s Dimensions of Brand Personality. Then put it in a mad libs format: (company) is (adjective), (adjective), but never (adjective). At this point, you might wonder, “Why go through all this trouble just to define our voice and tone?” The goal, really, is to communicate with purpose and clarity. Think about the amount of emails you send out everyday (or messages on Slack), or the number of product decisions you make with your team. Every customer touchpoint matters, and every design decision ultimately shapes the end product. How will you achieve your goals without clarity around what you’re trying to communicate – within your product, brand, or business relationships? More importantly, tools like message architecture help keep your voice consistent across channels, platforms, and mediums. Consistency builds familiarity and trust, which grows your brand. Before we document your voice and talk about tone, let’s test out these attributes on your users and customers. Remember that a great brand voice is distinct, recognizable, and unique. In the last section, we uncovered attributes that accurately represent your company’s values and mission. Now let’s make sure it resonates with your customers and is appropriate for your industry. To communicate in a way that’s relatable, it’s helpful to understand how your users speak. Your insight will help you use language that meets them where they are. Get your bearings by listening to your users online. Search through Twitter, Facebook, and blog posts to discover how people talk about your brand. The goal is to understand how current and potential users talk about your company, and see if there is a gap. Below is a page I’ve taken out of community manager’s playbook. A community manager is often the public face of the company, and this sort of market research is part of their job. You can do some or all of the things below to uncover how people talk about and relate to your brand. Determine who your target audience is and where they congregate. List the different channels you will investigate. It could be review sites, subReddit threads, or even Instagram. What content types are they using to discuss your industry category? Set up tools like Google Alerts or hashtag searches to monitor any mentions by media outlets or other social channels. Also consider tools like Topsy or Mention. Look for key conversation topics that involve your company or its products. They may be driven by your biggest brand advocates or revolve around your influencers. Write down the themes and worldviews that come up repeatedly. Note the aspects of the product that people appreciate. Find out why do they use it or visit your site. Look at product reviews and tips, and record how people describe your features and brand in general. Also take note of any pain points, questions, desires, complaints, improvements, and negative sentiments. 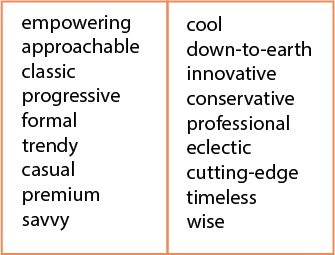 Record key words and phrases they associate with your brand. Also note the particular vocabularies and jargon people use to refer to your product or company. If you have time, you could refine those words and phrases to make your listening session more specific (i.e. for Apple: iPad, iPhone, MacBook). You might discover more engaged communities or more passionate, niche groups from which to learn from. If you don’t have much of a social media presence, or if your product/business is particularly complex, reach out to customers that are core to your business. Ask how they would describe your company and what problems your business solves for them. If you can, sit in on user research interviews and listen for key words, phrases, expectations associated with the product or brand. If you are pressed for time, ask your marketing or communications team to see if they have already conducted an online listening study. It’s likely that they do this periodically. Then create a list of words people used to describe your company. Include exact phrases they used to talk to others about your brand. Focus on what they say as well as how they say it. 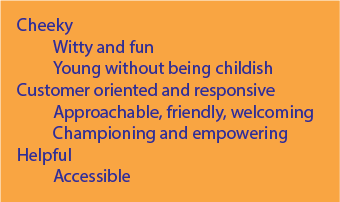 “Playful” and “fun” are similar in meaning but they evoke slightly different qualities. Cluster similar terms together and see if a theme emerge. Give it a name so you can share what you’ve found with your team and stakeholders. Ideally, your company and your external community are using similar kinds of words. If you notice a gap, you might reconsider how you’re communicating. A gap could signal an internal problem or indicate that your communication style doesn’t fit your users. There could be a difference between the company’s marketing message and the product’s user experience. When people within the company don’t agree on which words to use and which to avoid, you risk sending conflicting messages and confusing users. So how does your language compare? If you like what people are saying about you, then reflect their words and phrases in your copy. If it’s wildly different, it might be a good time to open up conversations about organizational goals. Even if you haven’t solidified a list of attributes, it’s a good idea to start with what you do agree on. Below are a few tools to help structure your discussion and reach consensus. These tools also help everyone who communicates on behalf of the company stay on the same page. One approachable way of documenting your brand voice is a “This But Not That” list. List some words that describe your brand, and then explain each one by what it doesn’t mean. The second word helps writers understand the boundary of each personality trait. One of my favorite is from GatherContent. Below is a template they use to guide clients on writing better editorial content. It’s smart to include a rationale to help writers stay on-brand. Red Bull: adventure, try, adrenaline. When you’re ready, try putting your attributes into a sentence format. It might help you summarize decisions around how your content should look, feel, and sound. Sara Wachter-Boettcher uses a mad lib that I found particularly helpful. Our website will empower people to (user action) the best way possible by helping users (user goal), (user goal), and (user goal). To do this, we must deliver content that is (adjective), (adjective), and (adjective). This content will make users feel (adjective) and (adjective), making them more likely to (desired action) and (desired action), which will help us (business goal) and (business goal). When a user visits our site for the first time, he/she should immediately see that we are (adjective) and (adjective). When that user digs deeper into the site, he/she will also notice that we are (adjective) and (adjective). When a user shares our content with peers and colleagues, he/she will tell them that we are a (adjective), (adjective), and (adjective) organization. Remember that the voice work never ends. You might need to revisit it as you add more people. As your company grows, it will need to change in subtle ways to reflect that. When in doubt, circle back to your mission and start from there. While brand voice should remain consistent throughout your product, tone adapts to circumstances or your customer’s emotional state. By varying tone, your communication will appear more lifelike and considerate. When you’re trying to get the tone right, it’s helpful to empathize with the person on the other side of the screen. Think about the situation your users are in just before they arrive or see your message. Who are they, and what did they come here for? What situation is the person in at the moment? Try to understand their frame of mind and talk to them where they are. Create content that try to put them in a better state of mind. Different content types will bring out different emotions, so you’ll want to first organize your content by its purpose. Then next to each content type, write down emotions that people could be feeling in the moment. Ask yourself: Is this good news that will make users feel happy, relieved, or excited, or is it bad news that will make them frustrated, angry, or upset? Will the message brighten their day, or put them in a bind? Are users prepared, or will they be caught off guard? We’ll summarize this in your style guide in just a bit. When you’ve been writing copy, it might be hard to tell if the tone is appropriate and useful. In this case, you could try reading your work out loud. Listen for awkward sentence constructions and phrases you wouldn’t say in a real conversation. You might also have someone else read your draft aloud to you. It might sound different when you’re on the receiving end of the message. Another time to talk aloud is before you write. Think of what you would say in person. If you are answering a potential question from users, pretend that you’re having a conversation with them face-to-face. Content should be useful and clear. Humor is a bonus when it happens at the right time. By trying to be funny all the time, you can make a situation worse and stand out for the wrong reasons. Jokes don’t belong in serious situations. If you’re already on thin ice, your customers probably won’t be charmed by your delightful sense of humor. Contact us and FAQs aren’t the best places to apply humor. People usually want to get something done quickly so it’s best to just get to the point. More often, they have a problem or complaint. Nerdy humor and pop culture references are best used sparingly since they may get tiring. They may also be taken out of context and get in the way of your main message. Leave these in blog posts and social media. Lastly, be careful of applying the same tone across different content types. What works well in one place may be tone deaf in another. Self-depreciating humor may endear passionate, early users but might undermine trust and confidence as the company and its community grows. Remember that attention should be on your users, not your brand. Put focus on them, not your ability to tell jokes. Otherwise you can come across as desperate for attention. Formal language brings professionalism and a sense of respect to the situation, but it can also come off as uncaring, stiff, and unapproachable. Informal language brings warmth and personality, yet it might undermine confidence. Take a look at how people within the company speak. What words do your co-workers use when they write emails? How do they greet each other and sign-off? The language they use might indicate how they communicate with people outside of the company. Scan and record any technical terms, jargon, slang, swearing, pronouns, and specific grammar conventions that appear frequently in your internal communication. Read it out loud to see how it feels. Do you feel uneasy? If so, the language could be too stiff or too casual. Now think about the people you serve. Formality can make users squirm, especially if they’re already in an uncomfortable situation. While informal language can inspire trust and intimacy, it might feel patronizing when it insults their intelligence. Then compile the terms that reinforce the your mission and voice. Ask your co-workers for input about which terms to avoid. What sounds natural to you can easily confuse your users. If you have your “This Not That” list, compare these terms to your voice guidelines. How well do they reinforce the brand voice? Which ones might come across as jargon to your audience? If the terms are familiar and understood by the vast majority of your users, it’s a good idea to keep those in your organizational vocabulary. In the end, it’s not about following rules as much as paying attention to the mindset of your audience. Every situation is different, but being prepared helps you respond to each one with empathy. How would you like to be spoken to in tense or uncomfortable situations? We’ve now covered both voice and tone. Hopefully you can now shape your brand personality through language. The final part is putting together a style guide that helps tie all your communication together. The key is to make it accessible and that doesn’t feel cumbersome to use. Pick and choose what to include. Keep it easy to update and reference. It keeps things consistent. It makes your content more polished and authoritative, while making it easier to collaborate with others. It creates clarity. It can highlight content goals, terms to avoid, and common language mistakes. It saves time. It can answer questions people didn’t know they had and keep things moving when you’re not available. It settles style debates without hurt feelings. It empowers writers. Co-authors, Nicole and Kate, describe it as a car manual: you might not use it every day, but it’s helpful to have around when questions come up. It teaches voice and tone. It helps writers understand your brand and your writing principles, and it guides how they choose words and tones for specific types of content. A style guide isn’t a band-aid for sloppy writing or a panacea for content problems. Think of it like a North Star. What you include depends on who will be using it. Is your audience seasoned writers and editors? Are they subject matter experts? Consider how your audience will use your guide and what they need to improve their writing. Principles: Help your team understand the spirit of the style guide. Give an overview of what you’re trying to accomplish with your content. It should align with your mission and complement your brand standards. Core values, purpose, and vision: Write down 3-5 core values and describe situations that show them in action. Make sure your purpose is focused on achieving your vision. Atherton provides a good framework on Slide 78. Voice and tone: Define your style and say how you’re different. Include tips for striking the right tone. Call out distinctive style decisions, including rhythm and pace of your voice. Write down statements to show how to put them in practice. It’s a good idea to include your ‘This But Not That’ list or several app messaging examples for each content type. Special considerations: For a highly-specialized audience, you may need to define a specific set of vocabulary. This might be the case for sensitive topics like disability. If you’re writing for children, consider their reading level. Resources: Include a list of resources that help people learn more about writing. Link to books and examples from the web that they can refer to easily. You can download the template from his website here. Embody a character. Warby Parker helps their writers inhabit the mind of their brand character, Warby Parker. Rather than strict rules, it explains style choices as, “Write like Warby Parker is the person you’d want seated next to you at a dinner party.” The guide is written in the brand voice, too. Keep it within reach. Sometimes, all you need is a reminder. Make it easy for writers to spot check their work before they share it. Kevan Lee from Buffer shared a framework (via Stephanie Schwab) that broke down voice into four parts: Persona, Tone, Purpose, and Language. Although it’s focused on social media, it might be helpful for someone whose main responsibility isn’t writing content. In fact, Buffer maintains a pretty great voice and tone guide itself. Finally, you can develop a comprehensive style guide or a light-weight one. GatherContent describes a light-touch and an in-depth method that might help. Language assembles systems, creates relationships, and helps people navigate to different places. Designing the language that exist within your app, digital products, and websites isn’t a nice-to-have feature; it’s a necessary part of the design process. Figuring out your voice, tone, and style doesn’t have to be complicated, despite the length of this guide. At its core, it’s about paying attention to how people feel and creating moments that make the interaction worth it. The words you use in the product say something about the company and its people that designed it. Don’t make people figure out why they should love your product – show it. Show it through the look, feel, and sound of your product. Do the hard thing; make it obvious that you care. Are people using your product significantly better off than they were before? Do they like the person they are becoming? We all have better things to do; why should we spend our heartbeats on it?